There is no need to rush into a DMV field office. Until October 1, 2020, a valid California driver license or ID card can be used for federal purposes, including boarding a domestic flight and entering military bases or secure federal facilities. After that date, only a REAL ID card or other federally approved documents will be accepted, such as a U.S. passport, passport card or military ID. California has an extension for REAL ID enforcement, allowing Federal agencies to accept driver's licenses and identification cards from California at Federal facilities, nuclear power plants and federally regulated commercial aircraft until October 10, 2018. When a state's extension expires, the state is subject to the statutory prohibition against Federal acceptance for Federal purposes of the state's driver's licenses and identification cards. 2018 is not quite 2020, so I guess the question is obvious... which government is lying?!? In November, questions emerged about whether the state’s REAL IDs were compliant with federal regulations and whether the agency could meet a Jan. 10 deadline for certification. The Department of Homeland Security on Wednesday granted the state agency a last-minute extension to meet those requirements, despite the government shutdown, extending California’s deadline to April 1. October 18, 2018 is a deadline for California, as a state, to become "compliant" with the Real ID act. If this happens, you'll be able to continue to use an old California license or state ID up until October 1, 2020, and after that time a Real ID (new-type drivers license or state ID with a star symbol) would be needed instead. If this doesn't happen, then after October 10, 2018, you'll have to use a passport or other federally issued ID; no California IDs will be accepted, not even new-type Real IDs, until California becomes compliant. Some people interpret California's DMV page as a claim that California is already compliant, but this is not confirmed by the Department of Homeland Security. The two dates come from two separate provisions of federal regulations. After October 1, 2020, the federal government is required to only accept ID documents that are Real ID compliant, for "federal purposes" such as boarding flights, and must refuse any that are not compliant. See 6 CFR 37.5 (b). So after that time, you will have to have a driver's license with the magic "Real ID" star symbol, or some other ID such as a passport. But this requirement does not take effect until then. 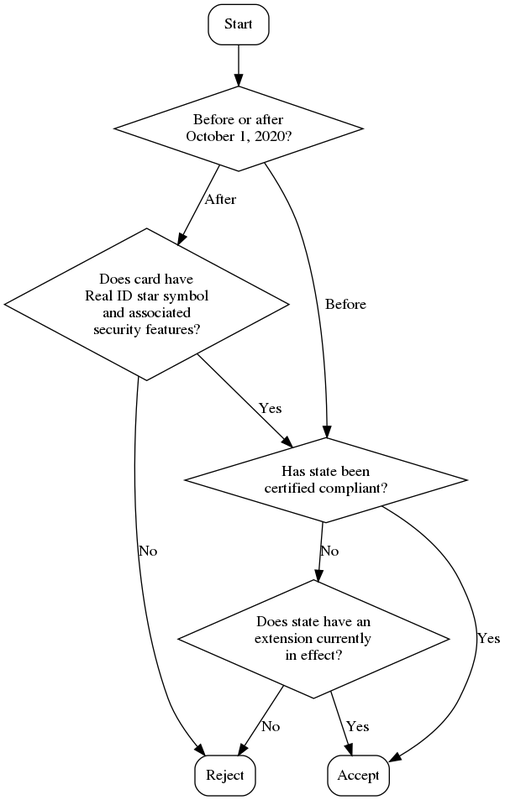 As a separate regulation, every state is supposed to comply with certain rules for how they issue ID cards, described in 6 CFR Part 37 Subparts B-D. If a state is not in compliance, the federal government is not supposed to accept any ID cards issued by that state; 6 CFR 37.65 (a). This provision of law is already in effect. As of right now, the Department of Homeland Security has not yet certified California as being in compliance; however, they have granted California an extension to achieve compliance, as 6 CFR 37.63 (c) authorizes them to do. This extension is currently valid until October 10, 2018, and while it is in effect, all California IDs will continue to be accepted. Until October 10, 2018: all California IDs are acceptable for boarding flights and other federal purposes, because of the extension currently in effect. This includes older IDs which are not "Real IDs" and do not have the star symbol. After October 10, 2018: it depends. If California is in compliance by then, or has received another extension, then all California IDs will continue to be accepted, including those which are not Real IDs. Otherwise, all California IDs will be refused (by my reading, this would even include those that have the Real ID star), and travelers would need to use a passport or some other form of ID. California seems confident that they will be in compliance, and for all I know they may be right. After October 1, 2020: Non-Real IDs will be refused. California's Real IDs will be accepted, assuming that California is in compliance by this time. If not, then all California IDs will be refused. California's statement assumes that they will be certified as compliant before their extension expires. If so, then it is true that all their IDs will be accepted until October 1, 2020. After this time, only their Real IDs will be accepted. DHS says that all California IDs will certainly be accepted until October 10, 2018. After that time (unless another extension is granted), California will have no special status, and will be subject to the general rule: California IDs will be accepted if, and only if, California is compliant. But DHS isn't making any assumptions about whether they will achieve compliance or not. One could be forgiven for misinterpreting the DHS statements as saying that California IDs will absolutely be refused after October 10, 2018. But they don't actually say that. For those who like diagrams, here is a flow chart of the criteria as I understand them. If DHS is satisfied with the state's progress, it will issue another one-year extension to October 10, 2019 when the process will begin again. (The annual extension after that will be the last one, to the final Real ID enforcement date of October 1, 2020.) Most of the 17 states & five territories currently in this status either already issue Real IDs (like California) or plan to start issuing them in 2019, though Oregon won't issue them till 2020 (just before the deadline). So the short answer is October 1, 2020. If the state can't prove to DHS that it's on the road to full compliance by then, that deadline could be moved up to January 2019 (or around January 2020 if it doesn't get the final extension), but that is highly unlikely. I'd say October 1, 2020 is 100% certain in certified compliant states, 99.9% certain in states already issuing them but not yet certified compliant (like California), and 99% certain in the remaining states. Not the answer you're looking for? Browse other questions tagged usa air-travel california identity-cards real-id or ask your own question. What forms of ID do I need to fly domestically from Massachusetts after October, 2018?